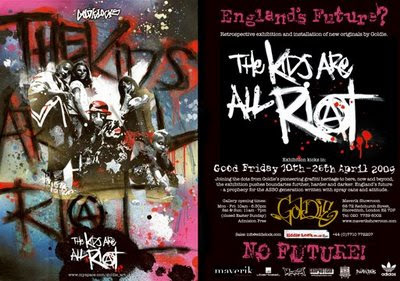 As I wandered around the web I spotted that Goldie opened his UK Solo Show 2009 this Easter weekend! The Maverik Showroom in Shoreditch will host a retrospective of Goldie's work from the 80s until today's "Apocalypse Angel" and "Estate Agent" series of paintings. There's a punk-ish, political theme in Goldie's paintings picking up on real estate insanity, global retail bullies and political instability, but for some reason it didn't seem so fresh after other stencil and graffiti artists like 3D or fine artists like Micallef have touched on these themes. Still, with airfares to the UK as low as $400 it's almost possible to go visit this show for a long weekend...or buy a screenprint online instead...hmmm! 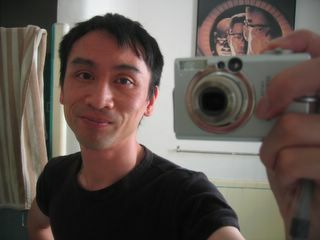 Here's a peep of the show courtesty of Unusual Image.